Pop Up Push Around Scissor Lifts are extremely popular throughout Europe due to their compact size and height access. Pop Up lifts are making their way to the United States to replace ladders, which are becoming less common on work sites due to safety concerns. 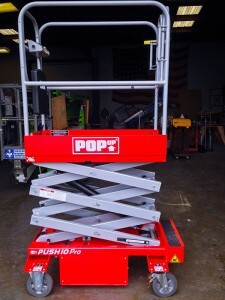 The Push 10 Pro is a safer and more efficient alternative to a ladder because it gives the worker a more productive platform for himself, tools and materials. Push Around Scissor Lifts are very compact and light which allows them to fit into elevators, giving workers an easier access to work sites. We have other scissor lift sizes as well!